This was actually a failed attempt at making Pumpkin Brownies. Well, not exactly a FAILED attempt. I mean, the recipe turned out perfectly, but they just weren't exactly what I was looking for. The recipe was even called Pumpkin Brownies as it was listed on another blog, but they don't seem very brownie-like to me. They're more like cake squares. But here's the thing... they're SO delicious that I couldn't NOT post the recipe! I shared them with a few friends and EVERYONE loved them. I brought them to work, and shared them with a customer who said they were HEAVENLY. So there you have it. They're not Pumpkin Brownies. They're Heavenly Pumpkin Squares! So deliciously moist, they just melt in your mouth. And they're so simple to throw together, you don't even need a mixer. You basically just stir everything together and bake. Doesn't get much easier than that! So give these a try. And if I ever find the right recipe for Pumpkin Brownies, I'll be sure to let you know! Mix together the first 4 ingredients. In a separate bowl, sift together remaining ingredients. Stir the wet into the dry, just until incorporated. Pour into greased 13"x9" pan. Bake 25 minutes or until an inserted tooth pick comes out clean. Don't over bake! Whip all ingredients together. Spread on warm cake. Place in the fridge to chill before cutting into squares. I like to let the icing whip for several minutes to dissolve as much of the sugar as possible. The longer it whips, the more the sugar will dissolve into the butter. You can do a cream cheese icing instead of the brown sugar, or just sprinkle them with cinnamon sugar as soon as you take them out of the oven, or even just dust them lightly with powdered sugar. 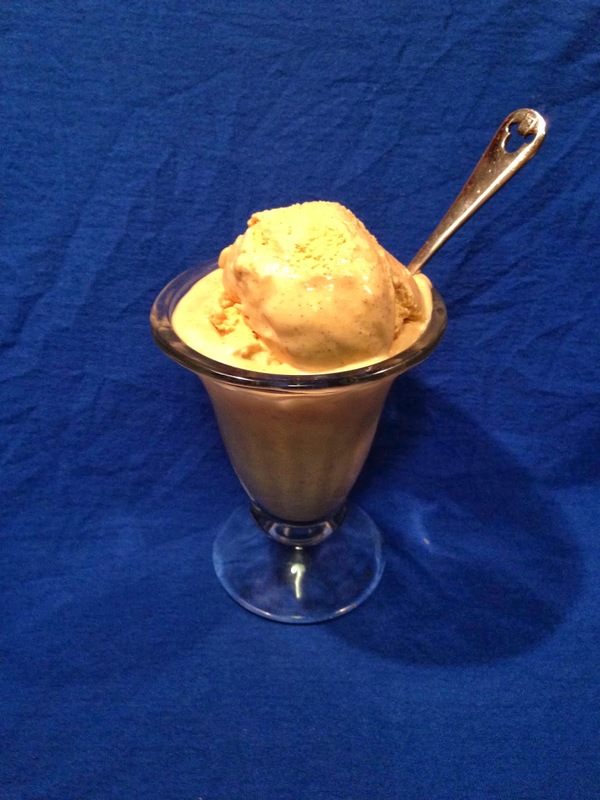 Have you ever had pumpkin ice cream?? Basically it tastes like a frozen pumpkin pie. How can you not love that?? And it couldn't be easier. You don't even have to deal with making custards, or tempering eggs, or even cooking anything at all. You just stir everything together, chill it for a bit, and then freeze it in your ice cream maker! And if you STILL don't have an ice cream maker, what are you waiting for??? Go buy one! And then make this recipe. SO good! Stir together all ingredients in a medium bowl. Set aside in the fridge until chilled. Pour into canister of your ice cream maker and freeze according to manufacturer's directions. Transfer to an airtight container and place in freezer until firm. I'm sure there are many brands of ice cream makers, but I use a Cuisinart, and it's awesome. And it's not very expensive at all! It kills me how people think that 50 bucks is too much to spend on an ice cream maker, but are willing to spend 5.00 or more on a coffee EVERY morning! Go fig! I've often said that my very favorite dessert in the whole wide world is an apple pie with ice cream and caramel on top. Mmmm.... apples and caramel... Seriously, is there anything better? So when I saw a recipe for a caramel apple trifle in Taste of Home magazine, I knew it had my name written all over it. Of course, I tweaked it a little, but I used theirs as my inspiration. I made it when Dan and Emma came for dinner and they absolutely loved it! It's a great do-ahead dessert, it's easy enough for the novice chef because there's no cooking/baking required, it feeds a crowd, and it's perfect for any fall/holiday party. And it's a showstopper! I guarantee lots of OOOs and AAAAHs when everyone sees it! In a large bowl, beat cream cheese until smooth. Beat in 1/2 cup caramel topping and a little sprinkle of apple pie spice, as much as you like. Fold in 2 cups whipped topping. In a 3-1/2-qt. trifle bowl or glass serving bowl, layer a third of the cake cubes, cream cheese mixture and apple pie filling. Repeat layers twice. Garnish with remaining whipped topping and drizzle with remaining caramel topping. Sprinkle with additional apple pie spice. Chill until ready to serve. I chopped up the apples a little bit just to make it easier to spread the filling over each layer, and I added a drizzle of caramel over each layer. More is more!! I also didn't do the layers exactly as directed, but it really doesn't matter what order you do. Just be sure to make each layer nice and even around the edges so everyone will see nice clean pretty layers. Btw, I usually don't mention specific brand names, but my very favorite caramel (other than my own home made) is Mrs. Richardson's Butterscotch Caramel Sauce. It is BY FAR the best. Just sayin! Yes, of course, you can do the whole thing from scratch. You can bake a Pound Cake and you can make your own Apple Pie filling and fresh whipped cream and home made caramel, but in this particular instance, I'm fine with going with the time saver method! Ok here's another amazing cake mix recipe. Remember when we made a Soda Cake just by mixing a cake mix together with a can of soda? Well, how about mixing it with a can of pumpkin instead? You'll be amazed at how moist and rich it becomes after it bakes! It seriously doesn't get any easier than this! It's so easy you don't even need a recipe! Simply mix together a cake mix and a 15oz can of pumpkin puree. Pour it into a greased baking pan, and bake it at 350ºF until it tests done. That's it! I made it for Sean and Casey and they LOVED it! It doesn't make a large cake, so it's perfect for anytime you're baking for a small group. Keep these ingredients on hand so you'll always have them at the ready! The original recipe said to use an 11x7 baking dish, but I used a bundt pan. It also called for an apple cider glaze, which is just powdered sugar, apple cider and a little pumpkin pie spice, but I opted for Fluffy Cream Cheese Frosting instead. You can't go wrong with either one! Use any kind of cake mix you like! I used a spice cake mix, but you can use yellow, vanilla, banana, even chocolate! It will all work! Btw, I think this cake is better when it's chilled. Just sayin! Green tomatoes? In a dessert pie? I know, I know... crazy, right? Who knew? But just go with me on this one! This is a great recipe to use when you have a bunch of end-of-the-season green tomatoes. You normally wouldn't think of a tomato as being a dessert item, but it's awesome when you add the orange and spices and raisins to it. I'm always intrigued when I see a recipe that uses an ingredient in an unusual way. So, clearly, when I saw this one, I knew I had to try it. The recipe is from Paula Deen, and I've made her other Tomato Pie several times (with great success! ), so I figured this one must be good too! Actually, I've read that you can use any Apple Pie recipe and just substitute green tomatoes for the apples. I chose this recipe because it seemed a little different with the orange zest and the raisins. And just wait 'til you taste it! It's sweet and spicy and the orange zest really pops with the tartness from the tomatoes. I bet it would be great with a dollop of fresh whipped cream or a scoop of vanilla ice cream! It's really fun and different and quite delicious! Try it! Mix sugar, tapioca flour (or corn starch), orange zest, cinnamon, nutmeg, and raisins in a large bowl. Lay tomato slices in pie crust. Sprinkle mixture over tomatoes. (Overlapping will occur but tomatoes will shrink in size when baked.) Gently lay top pie crust over filling, tucking in the extra crust around the edges. Pinch dough with fingers or butter knife to seal edges. Using a knife, make 4 to 6 slits in top of crust to allow steam to escape. Brush top with egg white and sprinkle with a little sugar to give your crust a shine. Place pie in the preheated oven and bake for 25 minutes. Reduce temperature to 350ºF and continue to bake for 20 more minutes. Cool on wire rack. *Instead of making the crust from scratch, I used a ready made refrigerated pie crust, just because they're so convenient and quick, but feel free to use my Easy Pie Crust, if you'd like. I decided to weave the pie crust instead of doing the slits in the top crust as directed. If you'd like to learn how to do that, just watch my video How to Make a Lattice Top. It's really quite sweet so I think next time I would probably dial back the sugar just a tiny bit. Also, be sure not to add more than a tsp of orange zest. It doesn't seem like it's a lot, but you don't want it to dominate the other flavors. I layered the tomatoes and sprinkled a little of the sugar mixture over each layer instead of just placing all the tomatoes in the plate and then dumping the sugar on top. I suppose you could also chop the tomatoes instead of slicing them and just mix everything together in a big bowl before pouring the filling into your pie crust.